But sum of the numbers must be a square number. 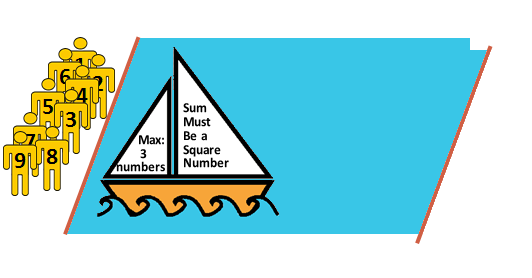 The boat can not sail back itself, so there must be some numbers to sail back. Plan minimum number of trips in such a way that all the numbers can cross the river. I use Microsoft Clip art organizer to search the individual pictures (boat and man) then compose the picture. The largest possible square that is the sum of 3 numbers is 16. First take 9, 5, 2, and bring back the 9. Then take 8, 7, 1, and bring back 7, 2. Next take 9, 7, and bring back the 9 again. On the fourth trip over, take 9, 4, 3, and bring back the 1. Finally take over the 6, 2, 1. Not the answer you're looking for? Browse other questions tagged optimization river-crossing or ask your own question. How can the man get across the river with the two animals and the cabbage?